SEATTLE – A Sounders team hoping to make the playoffs something other than an improbable dream can take a huge step towards that Saturday by doing something they haven’t all season. By beating the New England Revolution on the road, the Sounders would have consecutive wins in Major League Soccer play for the first time since last year’s Western Conference final. But saying it is the easy part: the reality is, the Sounders haven’t won at New England since 2011 and historically have had some of their worst matches ever at Gillette Stadium. Some of why the Sounders haven’t won consecutive games this year is evident right now; the team is about to finish a stretch of three matches in just seven days. 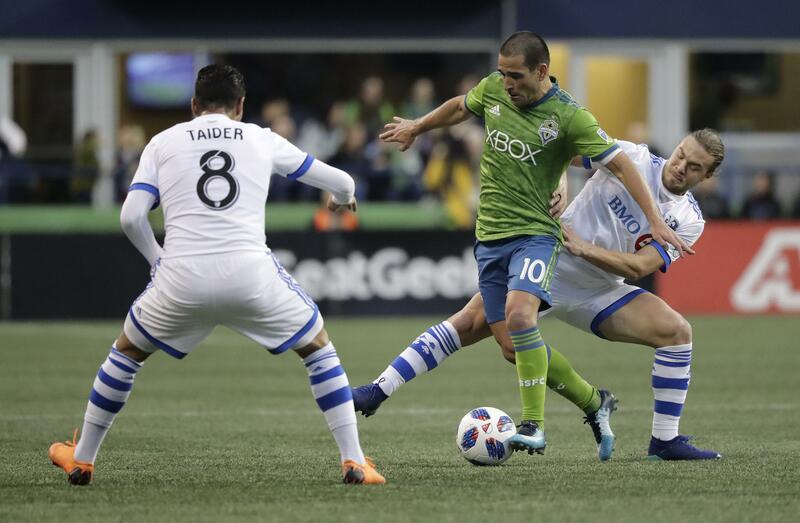 Beyond a quirky schedule with huge gaps followed by games bunched together since CONCACAF Champions League play in February and March, the Sounders have battled injuries and absences throughout that’s prevented players from performing in their usual roles. That changed somewhat on Wednesday, when veteran striker Will Bruin notched his first two-goal game of the season in a 2-1 win at Colorado. Having offensive talents like midfielders Nicolas Lodeiro and Victor Rodriguez back firing at full-strength has removed pressure from a banged-up Bruin to carry the offensive load on his own. “In the short term, it’s good,” Bruin told reporters afterwards, in quotes supplied by MLS. “We get some goals, the guys, we get a win, start playing with confidence, get the ball rolling a little bit. But we’ve got a quick turnaround in New England so we’ve got to be realistic with it. Bruin’s first goal was typical of so many of the 66 scored throughout his career – finding himself in the right place at the right time and burying his chance after the ball deflected directly to him. His second, game-winning marker came off a nice play by Cristian Roldan and good ball in from Rodriguez. Once again, Bruin didn’t miss his close-range opportunity. In essence, Bruin is a finisher that relies heavily on others to build up the play. He isn’t going to blow by defenders on his own, or handle the ball like a wizard. His biggest strength is finding open space and waiting for others – like Rodriguez and Lodeiro – to use their creativity to create chances and get the ball to him. For the first time all year, that’s started to happen. Things should get even more interesting eight days after the New England game when Peruvian striker Raul Ruidiaz is expected to make his Sounders debut at Atlanta. The trick for the Sounders has been to avoid falling so far out of a playoff spot that Ruidiaz’s arrival won’t impact the team’s post-season fortunes this year. The win over Colorado helped, though the Sounders and most of MLS had expected a victorious outcome over the lowly Rapids ever since the schedule was released. Winning at New England is a different story, given it’s the place the Sounders suffered their worst-ever MLS result – a 5-0 defeat – back during their otherwise powerhouse run in 2014. Back in 2010, the Sounders gave up three goals in just 11 minutes – a dubious team record – to the Revolution at Foxborough to turn a 1-0 second-half lead into a 3-1 defeat. Even last year at home against New England, the Sounders were down 3-0 before scoring an improbable three second half goals to salvage a draw. This year, the Revolution sit 6-2-2 at home and fifth overall in the Eastern Conference at 7-4-6. The Sounders, meanwhile, are 4-9-3 and remain eight points out of the nearest playoff spot in the West. For now, the Sounders have been helped somewhat by the Vancouver Whitecaps and the Houston Dynamo, the Nos. 6 and 7 teams in the conference. The Whitecaps dropping two in a row and the Dynamo earning just one point their two prior matches has enabled the Sounders to whittle the playoff gap to single digits. But a loss or draw at New England could cause that gap to reach double-digits again. And with the Sounders going into next weekend’s match heavy road underdogs against top-rated Atlanta United FC, things would likely get worse before they get better. In other words, for the Sounders to take charge of their own fate, they need to surprise some folks with a second straight win Saturday. Sounders coach Brian Schmetzer knows most of his current squad wasn’t around in 2014 or 2010 for the previous Gillette Stadium road disasters. But Schmetzer this week also lamented the overall difficulty of teams winning on the road in general. In that regard, given the extended travel to New England and the bunched-up schedule, it would hardly surprise anyone to see the Sounders get pounded again. Problem is, they no longer have the leeway to allow for such setbacks. Published: July 6, 2018, 6:07 p.m. Updated: July 6, 2018, 8:28 p.m.